Lexi Cobb, Abby Pressgrove & Daryn Lamprecht brought home top honors for 3A champ Silver Lake. 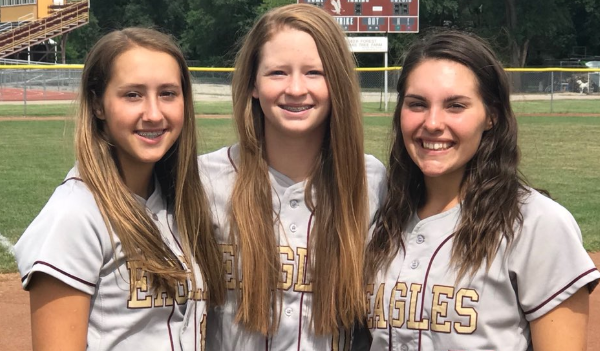 Sports in Kansas has released its 2018 All-State Softball Team. Selections were finalized by Sports in Kansas with input from several media outlets in Kansas. Input was taken from coaches and athletic director nomination forms sent in to Sports in Kansas following the 2018 season, not prior. This is not the Coaches Association Team, this is from Sports in Kansas only. They also have an all-state team. The sophomore catcher was one of the top power hitters in Kansas this spring. She hit 16 home runs over 26 games to go along with 36 RBI and a .523 average. Lamprecht and teammate Lexi Cobb are two of the top sophomore players in the entire state. Lamprecht has several offers at the next level to play and is ranked in the top 500 softball recruits nationally for 2020. Just like her teammate above, Cobb had an outstanding year. The sophomore who patrols center field for the 3A state champion Eagles had a .546 average this spring with 11 doubles, four triples and six home runs. She is ranked in the top 250 softball recruits nationally in the class of 2020 and has committed to play at Division I program, University of Louisiana-Monroe. The Silver Lake Booster Club would like to congratulate the Eagles on the 3A state title and all of their postseason honors in 2018 from Sports in Kansas. The Silver Lake Softball Team and Coaches would like to congratulate Lexi, Daryn, Abby, and Coach Workman on bringing home top honors from Sports in Kansas! Home of the 3A State Champs! Pressgrove helped the Eagles to the 3A state title this spring with a 17-1 record in the circle for the squad that finished 23-3. Pressgrove also hit .438 with three homers and 31 RBI. The junior struck out 135 batters in 120.1 innings pitched with a 2.38 ERA. Pressgrove has verbally committed to Benedictine.